See what the stars of Marvel's hotly anticipated movie wore to the London event. 1. 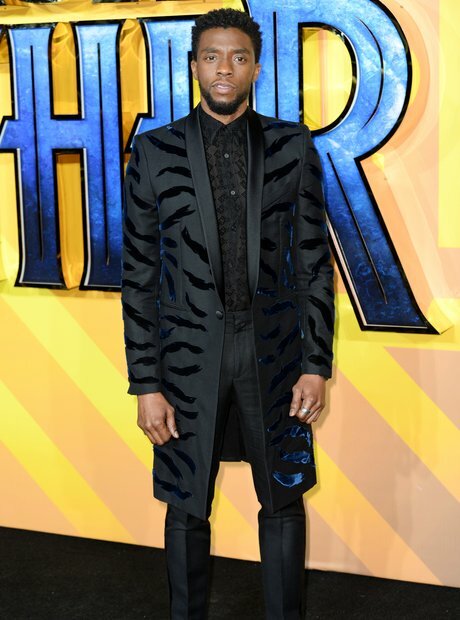 The Black Panther himself, Chadwick Boseman, looked sharp in a tiger-stripe jacket. 2. Michael B. Jordan, who stars as Erik Killmonger, was all smiles at the star-studded premiere. 4. Shining in a bedazzled plunging gown, Lupita Nyongo’o stole the show. 6. Oscar nominee and W'Kabi actor Daniel Kaluuya rocked a slick black suit and tiger-embellished tie. 7. 'Black Panther' director Ryan Coogler stands alongside the movie's protagonist, Chadwick Boseman. 8. Letitia Wright glowed in a strapless midi dress - the actress stars as Shuri in the upcoming movie. 9. Reprising her role as Ayo is Florence Kasumba, who shone in a glimmering pink number. 12. Stormzy and John Boyega pose alongside footballer Daniel Sturridge. 13. Krept & Konan hit the carpet ahead of the forthcoming Marvel release. 15. British rapper Nadia Rose stood proudly on the 'Black Panther' carpet. 16. Chart-topping producer Naughty Boy attended the event, which took place in the UK capital. 17. R&B crooner Lemar looked sharp in a navy blue jacket. 19. Jordan Stephens of Rizzle Kicks styled his hair with a flower garland. 20. Rudimental looked fresh as they posed for the cameras.